Beginning with the 2010-11 school year the data shows declining trend in both the Math and Reading EOG test scores. The largest drop came when the tests were renormed for Common Core in 2012-13. Stabilization of the test scores was reached during the following school year and overall gains continue to be made in succeeding years. performance scores in the most recent scoring data. . 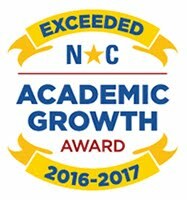 The classes that showed the greatest percentage increase were our fifth grade reading and fourth grade math. Verified data not released for current school year. Significant positive changes have been observed in the EOG data. Overall growth has been significant based upon BOY to EOY assement information. There have been as high as 39 and 36 percentage point gains in reading and math. Clearmont Elementary School is located approximately 10 miles north of Burnsville in rural Yancey County in the mountains of western North Carolina. Clearmont School has been the heart of this economically disadvantaged community since 1918. The present building first opened as a 1st – 11th grade school in 1936. Most of the current students represent the 4th generation in their family to receive their education at Clearmont School. There is one class per grade level. Over fifty percent of our students qualify for free or reduced lunch. Based on the 2012 US Census Bureau data, the population of Yancey County is 17,630. A five-member Board of Commissioners provides county government. The county property tax rate is $.50 per $100.00 of assessed valuation. The top employer in our county is Yancey County Schools. Mountain Air Country Club and other industries such as Altec and Glen Raven Mills are leading employers. The unemployment rate was 6.0% as noted in the ACCESS NC report of April 2017.. According to ACCESS NC 21% of the population is below the poverty level. Black and Hispanic students make up less than 5% of the total student population. Specifically, there are currently 2 hispanic students currently enrolled for the 2017-2018 school year. All areas in the the above referenced data have stayed stable during the previous school year. Technology continues to enhance our students’ test scores and learning levels from K-5. All of Clearmont’s teachers use technology daily in their classrooms. Chromebooks are 1:1 in grades 2-5. We were able to extend the number of Chromebooks through use of Title One funds. In 2012-2016, we received PBIS Model School of Exemplar recognition. Beginning with the 2014 school year Clearmont Elementary implemented K-1 Singapore Math and Wilson Fundations Reading Program with accompanying supplemental interventions for at-risk readers. Goal 1: 80% of CES K-2 students will be reading at or above grade-level proficiency levels by the end of the 2017-2018 school year. This number will increase to 85% by the end of the 2018-2019 school year. Goal 2: 75% of CES 3-8 students will be reading at or above grade-level proficiency levels by the end of the 2017-2018 school year. This number will increase to 85% by the end of the 2018-2019 school year. Goal 3: 100% of CES K-5 students will be taught high-level (Tier II, III) academic and content-specific vocabulary lessons with an approved, research-based vocabulary acquisition resource tool. Goal 4: 80% of CES K-5 students will be at or above grade-level proficiency levels by the end of the 2017-2018 school year in terms of Vocabulary Acquisition. - seek professional development to strengthten existing strategies such as the use of Google Education. - maintain participation in the 21st Century Community Learning Center After-School M.A.G.I.C.+ program to provide targeted instruction to students not at a mastery for a standard in Math and Reading. Goal 1: 80% of CES K-2 students will be at or above grade-level proficiency levels in math instruction by the end of the 2017-2018 school year. This number will increase to 85% by the end of the 2018-2019 school year. Goal 2: 70% of CES 3-8 students will be at or above grade-level proficiency levels in math instruction by the end of the 2017-2018 school year. This number will increase to 80% by the end of the 2018-2019 school year. Goal 3: 100% of CES K-8 students will be taught a systematic approach to computational fluency in the grade-appropriate core math skills of addition, subtraction, multiplication, and division as evidenced through the implementation of Singapore Math. Goal 4: 80% of CES K-8 students will be at or above grade-level proficiency in terms of the grade-appropriate computational fluency skills by the end of the 2017-2018 school year. -continue to phase-in of the Singapore Math Strategy/Program in K-3 Grade classrooms with supporting materials and training. This is to directly improve on student number sense, aromaticity, and critical-thinking with word problems. -continue to seek fidelity in the use of Motivation Math (2nd – 5th Grades). This program is designed to have both a paper and online component to assist blended classrooms. It will supplement the current CCSS Math instruction in those classrooms by providing compact, focused lessons and resources for teachers to use. District Goal 3 –YCS WILL PROVIDE HIGH-QUALITY, RELEVANT PROFESSIONAL DEVELOPMENT OPPORTUNITIES IN THE CORE ACADEMIC AREAS. Goal 1: CES professional staff will participate in ongoing professional development updates to address initial implementation issues, develop best practices, and incorporate within Curriculum Guides. The plan will also include ongoing professional development to sustain previous programs such as the YCS 1:1 Chromebook Initiative, etc. standard in Math and Reading. District Goal 4 – YCS WILL CONSISTENTLY AND COMPREHENSIVELY UTILIZE 21st CENTURY CLASSROOM INSTRUCTIONAL STRATEGIES TO MEET CORE ACADEMIC NEEDS. Goal 1: In order to efficiently meet the need of allowing students to access quality online, digital math and reading content pieces, CES classrooms will have technology items to allow teachers to assign students leveled-content in one-on-one, small group and whole group setups. Instructional practices will generally follow blended instructional practices in the core content areas. -have access to digital curriculum content including but not limited to:MobiMax, EPIC, Starfall, NCDPI Home Base-Schoolnet, etc. - in Grades K-5 Interactive Whiteboards with accompanying LCD projectors and Document Cameras to facilitate whole-class interactions with individual student engagement opportunities. We will add one board to the K classroom. Goal 1: CES will utilize quality research-based strategies to increase PARENTAL INVOLVEMENT in their child's education. - increase the number of Curriculum Nights at each to inform parents of current changes in the YCS Curriculum, as well as provide movie nights/reading nights for parental involvement activities. Clearmont is planning an EOG prep session night in April. -increase the utilization of the Power School Parent/Public Portal and Class DoJO Portal to further enhance school-to-parent classroom communication regarding student information and progress. -continue the Century Community Learning Center After-School M.A.G.I.C.+ program in 2017-2018 to provide targeted instruction to students not at a mastery for a standard in Math and Reading, as well as provide a means for parental involvement. Use of pacing guides for Essential Standards. Emphasis on collaboration and technology integration in all grades with the use of SmartBoards, document cameras, projectors, and Chromebooks in 2nd-5th grades and ipads in K-2 during center work. Emphasis on project based learning activities. Continued use of Small Group Reading. Enhance parental involvement by offering parent nights, PTO, and opportunities for parents to participate in field experiences. Continued implementation of the Positive Behavior Support program. Continued implementation of Olweus Bullying Prevention Program. Continued implementation the Dibels/3D (K-3) Reading Program. Continue Formative, Summative, and Benchmark assessments. Our school is in a rural isolated area of North Carolina. With approximately more than 60% of our students economically disadvantaged, we believe that project based learning is key to academic success for our students. We continually strive to communicate our students’ academic standing to our parents through feedback of student progress that includes examples of student work. We celebrate our students’ academic success through an awards program. Targeted students will receive additional instruction during the school-day. In past years, our budget has allowed for in-school tutoring and after school tutoring for the “at-risk” learners. However, in 2013-2014, we had to discontinue this due to shortage of funds as well as losing a teacher assistant. We were able to maintain our reading groups on the K-2 levels for the “at-risk” learners. The 21st Century Community Learning Center After-School M.A.G.I.C.+ program in 2018-2019 will provide targeted instruction to students not at a mastery for a standard in Math and Reading. We are using a combination of methods to best meet the needs of our students based on K-3 Assessments, baseline and benchmark testing, and EOG scores. An emerging area is the use of MTSS data. We believe that these strategies are the most appropriate to meet the needs of our students. Clearmont’s high quality and on-going professional development for its staff assists them in enabling all children in the school to meet the North Carolina’s academic achievement standards. Teaching is one of the top professions in this rural area. Yancey County Commissioners provide a local supplement of $150.00 for classroom teachers. Clearmont has received Honor School of Excellence, School of Distinction, and PBIS exemplar status as recent accolades. We recognize parents as full partners with educators and administrators to achieve the best possible learning experience for each child. A strong program of communication between home and school must be encouraged, continually evaluated, and maintained so the school and community are connected in meaningful and productive ways. Continue to involve parents in the joint development of the plan. Build the school’s and parents’ capacities for strong parental involvement through collaborative school-parent planning, ongoing parent-school communication, and integration of parents into school activities. The school website, blackboard connect calling system, powerschool “parent portal” and class DoJo are used for communication. We will continue to invite parents to join us for special programs, Parent Nights, Awards Day, and will provide timely information through the use of our school web page. Conduct, with the involvement of parents, an annual evaluation of the content and effectiveness of the parent involvement policy in improving the academic quality of Clearmont, including identifying barriers to greater participation of parents in authorized activities ( with particular attention to parents who are economically disadvantaged, are disabled, have limited English proficiency, have limited literacy, or are of any racial or ethnic minority background). We will distribute the Parent Involvement Policy to parents of all of our students. We will provide the policy in languages other than English to parents in an understandable and uniform format when necessary. The 21st Century Community Learning Center After-School M.A.G.I.C.+ program in 2017-2018 will continue to provide targeted instruction to students not at a mastery for a standard in Math and Reading, as well as provide a means for parental involvement. Convene an annual meeting during the first month of school (Parent Night/Open House), at a convenient time, to which all parents will be invited and encouraged to attend for the purpose of (a) informing parents of the school’s participation in the Title I program described in the NCLB legislation, (b) explaining the requirements of the Title I program, and (c) answering questions about the rights of parents to be informed about and involved in Title I. This night will also give parents the opportunity to hear an overview of the teacher’s plans for the coming year, and give them the opportunity to ask the teacher questions about her class. In the spring, we will involve parents in an organized, ongoing, and timely way in the planning, review, and improvement of Title I including the parent involvement plan. Provide assistance to parents, as appropriate, in understanding such topics as the state’s academic content standards, state student academic achievement standards, state and local assessments, and how to monitor a children’s progress and work with educators to improve the achievement of their children. The 21st Century Community Learning Center After-School M.A.G.I.C.+ program in 2017-2018 will provide targeted instruction to students not at a mastery for a standard in Math and Reading, as well as provide a means for parental involvement. C. Selection process for policy review committee. Clearmont has a small student population (110) with six regular classroom teachers, four support teachers and three teacher assistants. Due to the small size of the staff, all teachers are directly involved in school policy review and school improvement. All staff members are aware of school board policy concerning parental involvement. Policy information is reviewed as deemed appropriate during staff meetings and at PTO meetings in order to inform and involve our parents. This policy was developed by the SIT team with input from other schools and presented to the principal and teachers for review. Our annual meeting is held during the fall semester at the first Open House/Parent Night. Parents are notified in writing of the meeting and the agenda includes information about Clearmont’s school-wide Title I program. Parents are also notified of this meeting and the agenda through our BlackBoard Connect 5 automated calling system and through information posted on our school website. We have PTO meetings to inform parents and receive feedback from them about school activities. We will supply information to ESL or other non-English speaking parents in a language that the parents can understand. Parents are notified in writing of the meetings and the agendas include information about Clearmont’s school-wide Title I program. Parents are also notified of this meeting through our automated calling system and through postings on our school website. If meeting times are a problem for a parent, we reschedule an individual meeting at a more convenient time for them. The 21st Century Community Learning Center After-School M.A.G.I.C.+ program in 2017-2018 will continue to provide targeted instruction to students not at a mastery for a standard in Math and Reading, as well as provide a means for parental involvement. A copy of our School/Parent/Student Compact is contained in our Student Handbook that is given to students on the first day of school. The document is sent home annually for parents and students to review. Both parents and students sign this compact and return it to the Title I teacher. This document remains on file at the school. G. Staff information regarding the value of parental involvement. At the first teachers’ meeting at the beginning of each school year, the principal will review the North Carolina Department of Public Instruction’s parental involvement information. He will emphasize importance and value of parental involvement then review our program’s plan for documentation of parental involvement. Staff meetings will include information pertaining to the 21st Century Community Learning Center After-School M.A.G.I.C.+ program in 2017-2018. H. Evaluation of planned parent involvement. The principal will evaluate parent involvement in a number of ways. A log of parent attendance at PTO meetings, MAGIC + after school program, community/school workdays, teacher/parent conferences, and PTO hosted movie/reading nights will be collected and filed. In addition, all written communication, telephone calls, and email toand from parents will be documented throughout each school year by teachers. I. Funding for Parental Involvement. Not less than 1% of district’s allocation shall be reserved for parent involvement activities. These funds will be used to provide other parent involvement meetings in order to improve parental attendance. Title I funds will provide resources for the Kindergarten Welcome Day, as well as the Kindergarten Academy. Title I funds will be used to help put together a parent information packet and student welcome bag. Materials have been purchased for our Parent Information Center in the school Media Center. This material is intended to provide support and information for parents to assist their child with academic needs. Clearmont’s kindergarten transition strategies are designed to create a smooth transition for students coming to us from early childhood programs. We have transition meetings with rising kindergarten parents. At these meetings, school and classroom rules including the attendance policy are reviewed and discussed with the parents. A list of classroom materials that the child will need is given to the parents. Information about the child including any identified special needs is obtained from the parents. We have special orientation day that entering kindergarteners and their parents may tour the school. The kindergarten teacher and principal, meet with representatives from the all area preschools to discuss incoming kindergarten students and special needs that they may have. Our Kindergarten Academy during the summer targets incoming kindergarten students who have not had the benefit of a pre-school experience, but is open to all entering kindergarten. The fifth grade transition is a collaborative effort with Cane River Middle School. During May, a transition meeting will take place in the evening for fifth grade students and their parents. At this meeting, parents will be given information about the 6th grade, meet the principal, faculty, and staff, and tour the school. There will be guest speakers and faculty and staff will disseminate information about the courses, policies, activities, and other general topics about Cane River. Faculty and staff will answer any questions the students might have, reducing any fear or anxiety the students may be experiencing. This upcoming year we will be using our Title I budget to pay a classroom teacher’s salary and to increase the Chromebooks 1:1 district initiative for 2nd grade students. In the K-3 classrooms, teachers will assess all students to determine their level of progress. If budget allocations permit for tutors, students whom are deemed at-risk at this time will receive remediation/enrichment twice weekly in reading and math. In the third grade classroom, the Read to Achieve initiative will continue, with the students receiving progress monitoring each Friday by the classroom teacher. We will host a parent night for the third grade parents to inform them about this initiative. The 21st Century Community Learning Center After-School M.A.G.I.C.+ program will continue to provide targeted instruction to students not at a mastery for a standard in Math and Reading, as well as provide a means for parental involvement. A. Collaborations with Federal, State, and Local services and programs. Federal, State, and Local funds are utilized to purchase necessary equipment, pay salaries, and house our educational program. D.A.R.E. is a program that provides drug and alcohol awareness to fifth graders. This program is provided by the Yancey County Sheriff’s Department. French Broad Electric Corporation provides the Bright Idea grant opportunities. Yancey County Sheriff’s Department provides daily school walk-throughs to ensure school safety. Yancey History Association provides traveling trunks for school libraries to circulate through the year. 21st Century Community Learning Center After-School M.A.G.I.C.+ program in 2017-2018 will continue to provide targeted instruction to students not at a mastery for a standard in Math and Reading, as well as provide a means for parental involvement. Is the school currently in School Improvement or on the Watch List?